The idea of this project came from Olivier de Broqueville's son. He was dreaming of a small tool able to write symbols or pictures on a screen. If using a graphic LCD, it was too expensive (or too easy? 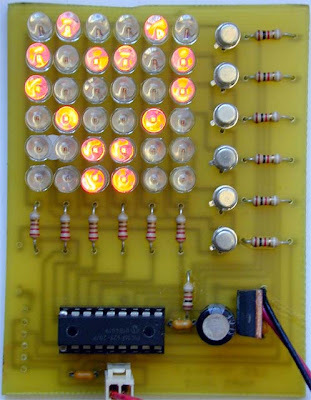 ), so the solution adopted was to pilot a dot matrix of Leds. The Dot matrix project need only some cheap transistors, common red Leds, and a PIC microcontroller 16F628. And the dream could become reality.